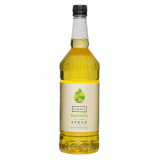 Monin Green Banana (Banane Verte in French) syrup in stylish 70cl glass bottle. Bananas are always picked green. As they turn yellow, they ripen on the way to market. Green bananas are fruits which have not had time to get ripe and to turn yellow. Green bananas have a 'green' taste somewhat like kiwi. They are slightly sweet and starchy. 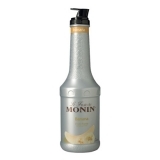 Try Monin Green Banana, and you will discover the real unripe banana taste, distinctly different from the yellow one. 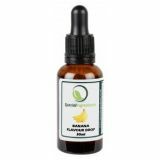 Taste: Nose of unripe bananas, rich and bold banana taste. Applications: Coffees, cocktails, milkshakes, cocoas, dessert drinks, smoothies, beers, fruit punches. Sugar, water, flavouring, colouring agents: E102, E133. Please note: Not compatible with steamed milk, or tea.